...sharing the panel with him, answering questions, plugging our store and just generally hanging out. Eventually I'll have links 'n' pics, I suppose (and maybe even an explanation why Employee Aaron was on the panel with Eric Powell), but I can't find anyone online with an eyewitness account to the horror just yet. The '90s was a strange time. Kids, if someone offers you some 1990s, remember to Just Say No! Yet another post of bullet points. Casual observation gained from speaking to customers 'n' employees: Dark Knight appears to be experiencing multiple views from moviegoers. I'm personally hearing from folks in the store who've seen the film twice, and a number who've seen it four times or more. It's been a long time since I've seen a film more than once on the big screen...I used to do it a lot more when I was a kid, in those days before home video. I think I saw the original Star Wars about four times during its initial run, and again during its rerelease a year or two later (I think). Even in high school I'd occasionally see a movie a couple of times, just wasting time with friends. I think I saw Sixteen Candles about a half-dozen times for no real good reason I can name. Well, "Molly Ringwald," that's one. And in my misbegotten college years, my pal/former coworker Rob and I used to drag different groups of friends to go see Bill & Ted's Excellent Adventure at the local dollar theatre. But since then...no, I can't think of any other repeat big-screen viewings I've had since then. Even if I really like a movie, I know it'll be out on DVD in about four months, along with bonus features/deleted scenes/other extras. (Someone, I forget who, once said that the theatrical release of a film is essentially a commercial for the DVD's more complete film experience.) I'd rather spend my film-going money to see something else, and save the rewatch for the eventual Netflix rental, if at all. Not that I'm against the idea of repeat viewings, or down on anyone who does. I personally just don't have the time or money or desire to do it myself. By the way, I'm beginning to hear a lot more people saying they didn't like the film, which, you know, fair enough. We all can't like the same things, after all. You'll be seeing lots of San Diego Con reports in the next few days, but there will be none cuter than the ones provided by Bully, the Little Stuffed Bull! Just keep checking this link for further updates, and great photos! 1. 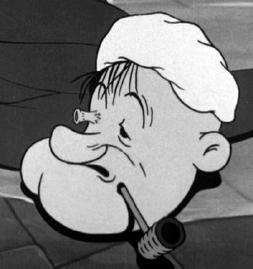 "Pere Ubu" asks me to identify the uber-violent Popeye cartoon I mentioned in my Twitter thingie. 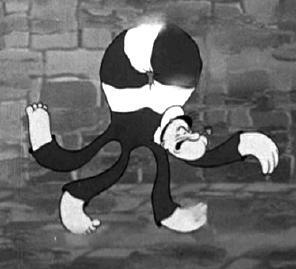 I think the cartoon I was talking about was "Organ Grinder's Swing" from 1937...I don't know that it really was any more or less violent than any other Popeye short, but it seemed like the usual Popeye/Bluto conflict was a little less...adorned, I suppose. More brutal than cartoonish. And again...great fun. 2. Reno Dakota asks if I've read the new issue of Ambush Bug , out this week at your finer comic book stores, and at ours, too. First, it's a shame that the '60s-style go-go-check cover is the retailer incentive variant, because that has it all over the "extreme close-up of the Bug's face" cover that's generally available. Third, the comic itself...it doesn't feel quite as anarchic as previous Bug adventures, but it's still amusing and it's nice to have the character back. 3. The Poser tells me that there's a Watchmen video game in the works. I did see this report earlier on Thursday, and it made me laugh and laugh. I want a first person shooter, featuring Rorschach and his assortment of grappling hook guns, spray cans and lighters, handsaws, et cetera. Or maybe a racing game, with all the characters in Ed "Big Daddy" Roth hotrods. Sure, why the hell not? Pal Cully reminded me of this commissioned drawing of Swamp Thing 's Abby by Rick Veitch. Very nice. Kinda sums up the early '90s, doesn't it? I'm not in San Diego. Thanks for the thoughtful comments and opinions about Dark Knight from my last two posts...they made for good readin' and I appreciate them. Don't worry, I'm not going to go on for a third day about the film. But darn, it was a good'un, wasn't it? The poor sap...er, the lucky fellow replacing Jeff is New Employee Tim, who used to work at a gun store, so we'd better be nice to him. Also, he's far too young for Old Man Sterling to deal with, what with all his youthful exuberance and his hip attitude and his rocking and rolling music. But at least there's the added benefit of his making Employee Aaron feel old, so that's good. And speaking of employees, both Employee Aaron and Employee Tim are spending all four days down at the San Diego Comic Con, leaving poor Mike, alone and afraid, to sling comics all by himself. Well, I would be all by myself, except I put the call out to the Legion of Former Employees, and lo, they did answer. For Thursday and Friday, we will have the shocking return of Employee Josh (second Employee Josh, not first Employee Josh). Presumably Josh won't be dressing as a Hogwart's student, like in that pic I linked, but you never know with him. For Saturday and Sunday, it's yet another return engagement of the world-renowned Kid Chris, who will delight and amaze with feats of magic and acrobatic prowess. Here again is that pic of him dressed as a cowboy, in case you need a reminder of what he looks like. I don't know if he'll be dressed as a cowboy while working at the shop. Maybe he'll take costume requests from the customers. On the down side, we received on Wednesday a boatload of backstock books from Diamond that we didn't order and, thankfully, weren't invoiced for. It was a minor inconvenience, but one we didn't need to deal with during the usual Wednesday morning order breakdown 'n' panic. On the upside, among these items were some copies of the Watchmen graphic novel which we actually could use, since our mighty sizable Watchmen restock is still winging its way to us. So, I just told our Diamond rep to charge us for 'em and we ended up selling them immediately. A late follow-up to my "Fates of the Peanuts Gang" post from a couple of weeks ago: reader Daniel e-mailed me with a link to "Rest in Peace, Charlie Brown" -- kinda like the Ragnarok of Peanuts . Thanks for the link, Daniel! ""God is a fictional character appearing in Image Comics." "God is a fictional character in Image Comics, and in the real world." ...which I'm sure wouldn't bother anyone at all. The other major change is the "Created by" credit, which usually reads "Todd McFarlane," but sometimes reads "No one--he's God!" -- and I'm suspecting the person changing the "fictional character" line and the person changing the "created by" credit are working at odds with each other. The only thing that really bothers me is the last line of the entry, which is sometimes missing that preposition I noted in my original post, and sometimes has that preposition. Those guys can have their theological debate...I just want that "to" back in there. I resisted saying "Purrrrrrr-fect" in that last sentence, but only just barely. First, I apologize for the relative sloppiness of yesterday's post. I had to decide between "sleep" and "the weblog," and I picked "the weblog" because I wanted to get my thoughts out there on the new Batfilm while they were still fresh in my noggin. I think I should have chosen "sleep," as the memories may have been fresh, but my ability to form coherent thoughts was not. So, if you slogged through yesterday's post, thank you for your indulgence. Rohan pointed out that there was a lot more moral ambiguity present in the film outside the circumstances the Joker forced upon our heroes. And he's right: nearly everyone in the film makes a choice about lying to others, hiding information, obfuscating events, violating privacy, all in the name of the greater good. There's still a significant contrast between what the characters do to themselves and what the Joker does to them: the Joker attempts to make people make choices that serve their own self-interest, while by and large the moral choices, the lies and the deceits the main characters perform, are for the protection of others. The question the movie asks, and is mostly not answered, as Rohan says, is whether or not compromising a moral position for the right reason is the correct thing to do. That's certainly more to chew on than you tend to get in your average summer action blockbuster, and gives this Batman film far more thematic weight than any of its predecessors. Joshnunn and pal Jo note another borrowed element from Killing Joke ...the "multiple choice" origins the Joker reveals about himself. Interestingly, that multiple choice aspect seems obvious to us, since the idea is familiar to us from Killing Joke , but it's possible some people didn't get that. Roger Ebert didn't seem to catch that in his review, writing about the Joker's supposed childhood drama as if that were the explanation for his scars. David Cutler points out that Batman in the Burton films was a little more free with the killing, taking out thugs left and right, making a save for the Joker at the end of that first film out of character had it happened. And he's right...the Burton Batman doesn't have quite the same moral boundaries that the Nolan Batman does. But I think my point still stands, that a very specific parallel is drawn between the two films by their similar Joker-oriented climactic moments, and the differences in how they're handled is very telling in regards to each filmmaker's perception of the Batman character. Speaking of the Burton films, the quick line in Dark Knight about Wayne asking Fox to make him a new cowl which will allow him to turn his neck...I kinda read that as a poke at the earlier movies, even if it sorta applies to the newer films too. There's some discussion of a third film in the comments, too...and while I'm hesitant to want to see a threequel (given the usual diminishing returns we get in our superhero movie series), there's no denying that Dark Knight was better than Batman Begins . Thus, there may be hope for a decent third film. Batman's left in bit of a spot at the end of the second movie, so some resolution to that would be nice. But even if they leave it there, with no further film, I'd be okay with that, too. It would certainly underscore the themes of the movie if Batman is left forever in that cinematic limbo, always the outcast, always the scapegoat, bearing the sins of Gotham City for all time. Of course, the movie made a gazillion dollars, so we're getting a sequel no matter what. I hesitate to predict a villain (or two) that'll be in the new film, but I'm hoping for Mad Hatter. No reason, beyond seeing what they'd do with him. And because I'd think it'd be funny, since I'm a bad person. But I'm betting the folks saying it'll be Catwoman will probably be right. As Mathew says, each film has focused on villains that serve to reveal more about Wayne/Batman's motivations. And as pal Dorian opined to me yesterday, Catwoman would be a perfect character for such a purpose. The Dark Knight is about as good as you've been hearing...a truly affecting and even thoughtful movie, but not skimping on superhero action while simultaneously posing some questions about morals, ethics, and human nature. It's not as terribly deep as all that...the moral dilemmas aren't anything we haven't heard before, but the actors' uniformly-strong performances give the material the support it needs. It's nice when an action film gives us something more than "I hope the good guy beats the bad guy up," and that's what Dark Knight delivers. As per usual, I have a handful of SPOILER-laden comments that I wish to make, and I'll do so right after this pic of Heath Ledger as the Joker. The SPOILERS end when you see Michael Caine as Alfred. Of course, Heath Ledger's performance as the Joker was the stand-out, giving us something just familiar enough to previous filmed Jokers to latch onto, while giving it enough of a horrifying, grotesque twist to keep us on edge. There was a lot of nervous laughter in our theatre at the Joker's behavior. The occasional moments when you see the Joker just sorta mumbling to himself...that's what struck me. The Joker isn't a guy playing up the clown motif and acting like he's crazy. He really is crazy. Boy, they couldn't foreshadow Dent's eventual transformation into Two-Face enough, could they? For some reason, I found Christian Bale's portrayal of Bruce Wayne in this film to be a lot more acceptable to me than in Batman Begins , where he seemed just too young and too...well, dorky to be the alter ego of the Dark Avenger of the Night. Wayne by and large looks more haunted in the new film, more weighed down by his history and his Batmanly duties. Even when he's in action out of the Bat-costume, he still exudes a Batman-ness about himself. I never got that with his previous performance. The film appears largely informed by the hypothesis presented by the Joker in Alan Moore and Brian Bolland's The Killing Joke : that all it takes is one bad day to transform a regular joe into something beyond normal moral behavior...like, oh, say, the Joker. There's a lot of testing of characters' moral boundaries in this film, as the Joker prods them into discarding their ethics for their own benefit, to largely similar results as in the comic...with the exception of Dent, of course. Speaking of Dent...unlike the "let's throw in as many villains" recipe of other Bat-films, having Two-Face and the Joker in the same film actually worked thematically. The Dent/Two-Face character arc was in service to Joker's ethical challenges, not in addition to them. Dude, Batmanuel as the mayor of Gotham. Fantastic. Was that particularly heavy eyeliner he was wearing, or does he normally look like that? I can't help but think of the first Tim Burton Batman film upon seeing the conclusion to this film's Batman/Joker conflict. In the Burton film, Joker falls to his death, whereas in the new film Batman manages to save the Joker from a similar fatal fall. I don't recall specifically the circumstances around the Joker's death in the earlier movie, but I seem to remember that Batman could have, you know, done something about it. It certainly strengthens Batman's moral position in the new film. Okay, he does end up tackling Dent who then falls to his death, but Dent was about to kill Gordon's kid so, you know, we'll give that a pass. That said, having Batman use guns...even motorcycle-mounted guns, not even handguns...seems wrong, given what we know of the character and of his long-standing aversion to firearms. I like the more-or-less understated conclusion to the subplot involving the Wayne Tech guy discovering evidence that Wayne is Batman. The knowing look exchanged between Wayne and that fella after Wayne saves his life -- the one that said "you owe me BIG" -- I was pretty amused by that. And the ending, leaving Batman on...well, he was already on the wrong side of the law as a vigilante, but now he's really on the wrong side. That was a nice Empire Strikes Back -ian way of wrapping up the second installment, and establishes some important differences between Batman and other superheroes, regarding his willingness to be the scapegoat for the greater good. Well, there you go. Good film, worth watching. I would have more to say, but I'm posting this very late at night...well, early in the morning, actually, and I'm going to bed. I have some other general thoughts on the film that I'll transcribe when I'm not half-asleep. Let me know what you think of the film in the comments...or post links to your own reviews. Go ahead, I don't mind. Things that amuse me far more than they really should, #2343. "God is a fictional character appearing in Image Comics." "Notable aliases - The Father, The Creator, The Lord, Supreme Ruler Of Heaven, Allah, Yahweh, Creator Of Mankind"
"Abilities - Immortality,Invulnerability,Nigh-Omniscience, Supernatural strength, Massive Destructive Capabilities,Relative Omnipotence, the Power of Creation." ... and I must be one of the few to not have had the pleasure, judging by its box office take. Yowza. I'll be getting to it tonight, if everything goes as planned. I hear it's not half-bad. One consequence of the Watchmen trailer being attached to Dark Knight was the number of requests we'd had for the graphic novel over the weekend. We had a few on the shelf, which is generally enough to meet demand most of the time. Most of the time. Ah, well...at least we have a large restock coming in. I was expecting an increase in interest prior to the Watchmen film's release, but totally wasn't ready for the trailer to kick it off. And even if I did expect a sales bump from the trailer, I didn't find out that the trailer was attached to the new Bat-flick until...Thursday, maybe, which wouldn't have been nearly enough turn-around time on reorders anyway. But the books are on their way, and I expect to do good business with them. Now the sales after Watchmen 's release...ah, that'll be the trick, won't it? So, that Marvel promo/poster calender thingie that came out a few weeks back, the one that featured Michael Turner's variant cover art for the forthcoming Uncanny X-Men #500? 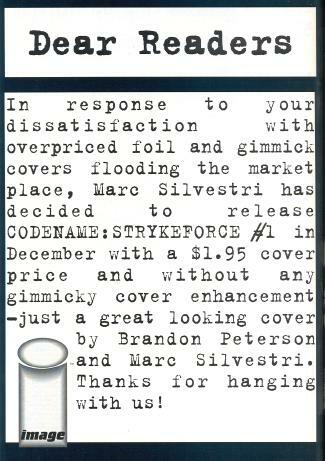 The one that Diamond comic shop accounts received in the hundreds, all for free? Here are your eBay auctions. At least, as far as I can tell, none of the current sellers here are pushing the calendar as "VERY RARE," which I saw in some completed listings for this item. It's a fast food premium or something like that. His little right leg is spring-loaded so that he could kick...something, I guess. Yeah, I know, "the bucket" har har. But really, for something designed to be given away to kids...good gravy, that's creepy. 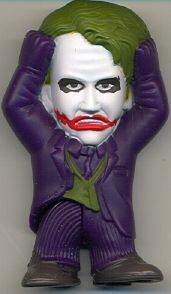 Richard over at Baboon Bellows posted a pic of another Joker figure in this same style. 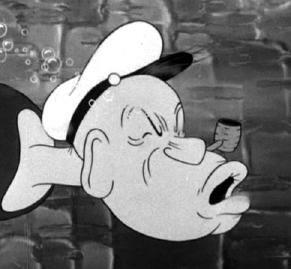 No time for a real post, so it's back to the Popeye DVD.